Imagine this bridge covered with rushing water and logs jammed at the base and near the top. 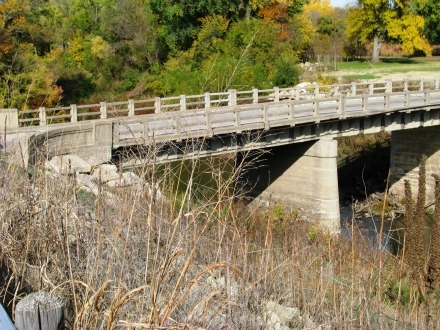 This old bridge has survived the flash floods and high water but looks peaceful at the moment as the flow of water has slowed during the drought of 2011. Water from the Florence City Springs flows into the Cottonwood River. The age of the bridge is unknown.